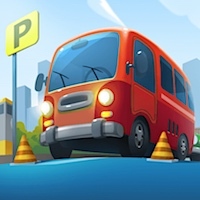 PARKING SMARTY | Free Mobile Games on Funky Potato! Park your bus, moving it along the parking lot. You can only move in one direction, until you meet an obstacle, like curb or street end. Collect golden stars for bonuses. Think twice before every move!